You've probably ended up here because you're an adventure rider or you've watched one of our films and started clicking around on the internet. So welcome to the home of Eye of the Rider Moto Docos. When Duncan started riding bikes with Josh in 2008, he thought he wanted a bit of adventure, but he didn't know he'd get a whole lot more than he bargained for. (Check out the story of one of their first rides here) Josh warned Duncan that he likes to look for the worst way to get anywhere. And Duncan soon discovered why there were no other riders interested in following Josh. It was tough-going, but worth the struggle. Why? "Australia has a lot to offer an adventurous person." Says Duncan. "Because sometimes getting to the good stuff is a bit tricky. Now I realise why Josh rides where he does. Just having 'Adventure' written on your bike doesn't make you an adventurous person. Getting off the beaten track does. Eye of the Rider motorcycle documentaries are some of the earliest examples of film-making using "Point-Of-View" cameras to show the action from the riders perspective. Duncan and Josh do this by using a variety of cameras, some mounted on the rider, some on the bike. "The other bike ﬁlms we had watched were all about wheelies and showing off." says Josh. "And I am not into diary cams and when the making of the ﬁlm is included in the ﬁlm. 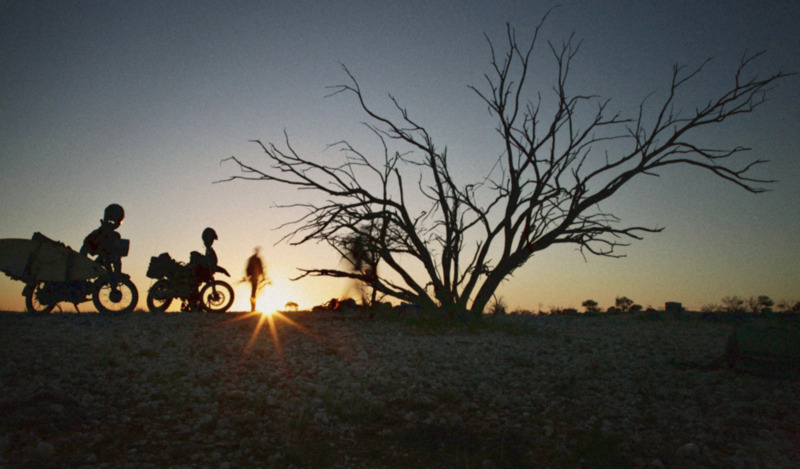 Eye of the Rider Moto Docos are made in the opposite of that style." Duncan has university qualiﬁcations in ﬁlm but chooses to work in the building industry. He has had multiple photography exhibitions from his travels throughout the world and produced a book on his travels in India. He prefers his work to be art rather than commercial. Having spent most of his life traveling on public transport, Duncan’s eyes were ﬁnally opened to adventure on the bike in 2008 when he bought his KTM640. He plans to ride it for a very long time yet. How did the ride change his life? Upon returning from the ‘Arrows of Fire’ ride Duncan travelled to Europe, met his future wife, came home, got married (despite saying he was a bachelor for life), and (despite saying he will never want kids) 18 months after the wedding his son was born. A professional photographer who, after exhibiting just once, decided to concentrate on the money side rather than the art. “Bikes were too expensive to pursue art” he says. Josh ran an advertising and editorial photography studio for 10 years. (Formally) Known as - Mr Full throttle! Josh’s insatiable desire to always ride ﬂat-out has seen him down grade to slower and slower bikes, although he manages to tune them faster and faster. Never has this tendency seen him in as much peril as now. One year after returning from the ‘Arrows of Fire’ ride, Josh left the ocean and surﬁng behind. He his family moved from the Eastern Suburbs of Sydney to a 5 acre bush block in Galston in North Western Sydney. Josh was interviewed on the TV show ‘Temporary Australians’ on Channel OneHD, but he is not taking it as an omen.